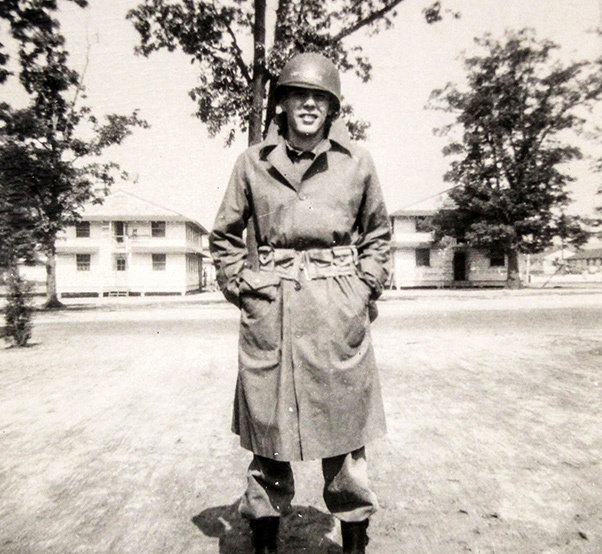 Retired Chief Warrant Officer 2 William J. Opferman poses during basic training at Fort Dix, New Jersey, in 1948. I was in the occupation force in Japan. As soon as the war broke out in 1950, we went to Korea. We had all kinds of adventures. I was there for — it was supposed to be for a year — but then we got extended for another year. I was in the armored cavalry, but I served as a guard to Gen. Walton Walker, commander of 8th Army. General Walker was very good to his guards. He would go up and visit the front sometimes, and we would go up there with him. Gen. Walker liked to have his driver speed all of the time, and he used to stand up in his jeep. He had a bar built in his jeep, and he would stand up in his jeep so the troops could see their general was coming … The driver had to swerve a little bit and the general got swung out and he hit his head against the pole. General Walker, I think, was a good general, but Gen. Matt Ridgeway, who replaced him, was a great general. When Gen. Ridgeway first arrived, he wanted to go out and visit the front one morning. He was a big man and he carried the M1 rifle as if it was a swagger stick. 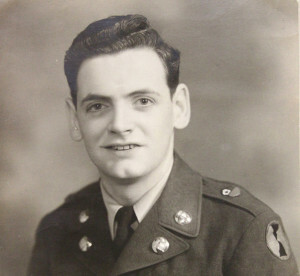 He carried the M1 rifle in one hand and he had a grenade — it was his trademark — taped to his suspenders in case he needed his grenade. So he comes out, and the first thing he does was he walks up to me and he sticks out his hand and says, “Name’s Ridgeway. What’s yours?” He would just go up and sometimes talk to some of the troops and give them words of encouragement and look over the situation, just assess it and see what he could do. 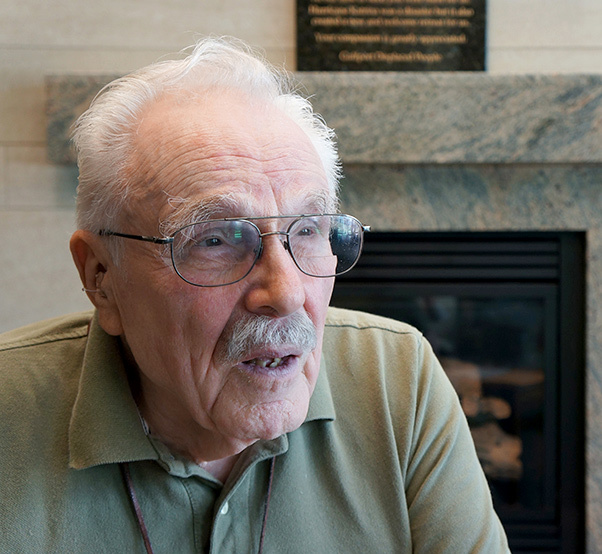 Retired Chief Warrant Officer 2 William J. Opferman talks about his experiences during the Korean War at the Armed Forces Retirement Home in Washington, D.C. When Gen. Ridgeway first took over, we started up to the front and there was a break in — the line had broken down and there was a whole bunch of Korean soldiers were running away from the war. There was no line there at all. So he stops right in the middle of the road, stops them all and says, “Who’s in charge?” They didn’t know, so he picked out some Korean officer and said, “You’re in charge. Get these men and march them back up to the line.” And he watched until the Korean officer took charge and marched them back up to the line. In Seoul, we were fired on by Bed Check Charlie. He was one North Korean with a machine gun and a little small airplane. He used to come over by himself late at night and fire his machine gun on any of our quarters that he could see. He came pretty close. We set up a decoy for him one time. We got an abandoned place and we put lights in it. We had some antiaircraft guns and we were bunkered in, but he didn’t fall for it. I went there and it was pretty good, but I realized I preferred police-type, guard-type duties. I went over to the military police company — I was still a corporal — and I asked for a transfer. 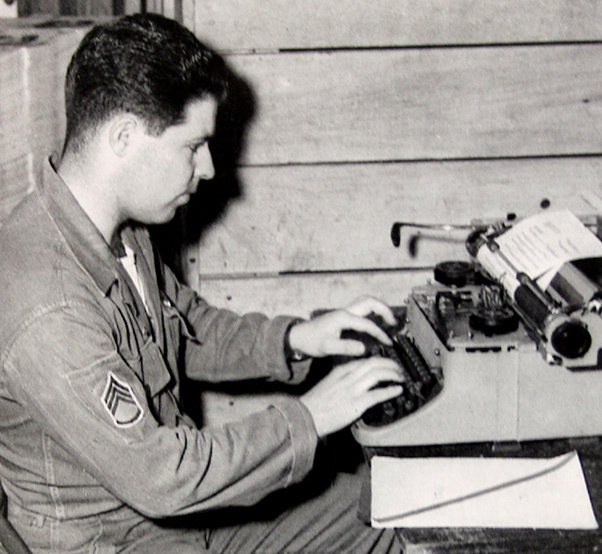 Richard W. Robinson as a clerk typist in the Army. Robinson would eventually reach the rank of sergeant major. I joined the Army when I was 17. That was in 1948. I got my orders December ’51, and I had to report to Seattle. From there I got a boat and went across the Pacific. It took us around seven or eight days because we hit some bad weather. We landed at Yokohama, Japan. … At [another camp], they outfitted us with our field equipment, issued an M-1, live ammunition and whatever else we needed. We took a train from Tokyo to Sasebo, Japan. From there, we got a freighter. They took us over to Pusan, Korea. From Pusan, I was sent up to Taegu, to the repo depot — that was the replacement depot. We used to fall out every morning. One morning we fell out and the sergeant in charge says, “Can any of you guys type?” I got shipped up to Seoul, and I was assigned to mail and records. Eventually I went into the classified message center. I got assigned to the night shift. We used to get the intelligence report from G-2 and the operations report from G-3, which were both classified secret. They used to come in at 5 o’clock in the morning. We used to process them and then make these pouches to the units that were involved. Then we would send them up by plane up to the front. They had to be there by 10 o’clock in the morning because that’s how they used to do all of their planning for their operations and intelligence, to know where the enemy was and everything like that. Retired Sgt. Maj. Richard W. Robinson talks about his Korean War experiences at the Armed Forces Retirement Home in Washington, D.C. I did that for 18 months. I was there until August of 1953. I was there when the armistice was declared, when they signed it in July of ’53. I had it good. We lived in a school and we had a hot shower and we had a dining hall and hot food. Robinson remained in the Army after his tour in Korea, eventually returning to the country for another assignment in 1967 and rising to the rank of sergeant major. Nobody knew where Korea was. I was over there when Korea got their independence. I believe it was the end of ’48. I was working in the post exchange. I traveled from Seoul to Incheon maybe once, twice a week. I was pretty young, and I didn’t get around in the town that often. Our compound was sort of out in the outskirts of Seoul, so we didn’t go into Seoul very often. Retired Chief Warrant Officer 3 Charles Daniels as a young Army technician. After I enlisted, I had 10 years in the combat engineers and eight years in guided missiles. Then I was in communications, the Signal Corps. I took advantage of the military, I really did. Every time I enlisted, I enlisted in a school, like I said, the engineer school. I went to the guided missile school at Fort Bliss [Texas]. Then I went to signal school at Fort Monmouth [New Jersey]. I got a pretty good education in the military. I had two tours in Vietnam. I was there in 1965 to 66 at Qui Nhon and Ia Drang and then again in ’69 to ’70 in Phu Bai. I was one of the first to go into Vietnam. It was different, OK? At that time, I was in communications. I had a platoon of specialists to repair the electronic equipment, if it breaks down. Sometimes, I’d take a vehicle out to the outpost to service the communications equipment. Basically, I supervised all of the outgoing maintenance. Our mission was to maintain all of the communications equipment. My second deployment was communications also. I had a platoon with different signal equipment to repair radar and stuff like that. The infantry and the artillery and Special Forces, they did the brunt of the fighting. It wasn’t very nice there even if you weren’t in combat, the conditions of living in a tent continuously. When we first got there in 1965, we had to set up the toilet facilities and things like that. Toward the end — the living conditions were not great, but being in Vietnam where I was, they were better than what other people had. They had an enlisted club and they had an officers’ club there also. They just made it themselves. We had a regular meal. We didn’t have a dining hall, per se, but we had a tent area that was considered the mess hall. 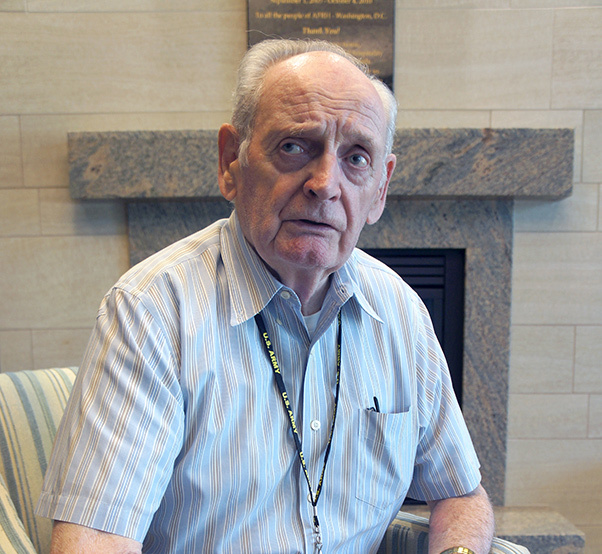 Retired Chief Warrant Officer 3 Charles Daniels talks about his two tours in Vietnam from the Armed Forces Retirement Home in Washington, D.C.
We had a couple of mortars come in. … Like anything else over in Vietnam, there was no really secure area. You could get mortared at any time. When Daniels left Vietnam, he returned to his family in Germany, so he avoided the protests and vitriol aimed at veterans returning to the States. He retired in 1970 and went into business for himself. The biggest thing when we first got to Vietnam was the smell and the heat. It normally ran somewhere in the neighborhood of 90 degrees where we were at, sometimes a little hotter. The humidity was way, way up there. Former Staff Sgt. 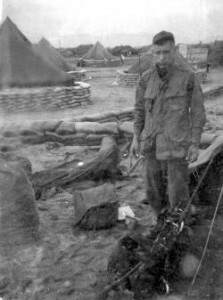 Dewey Smith poses in Vietnam in 1966. 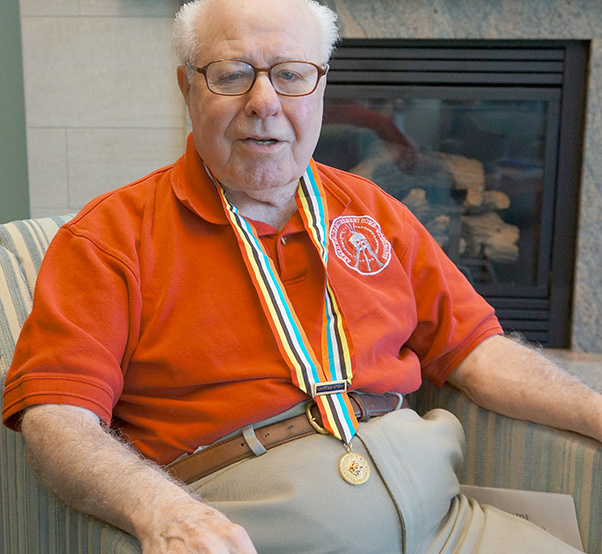 Smith served three consecutive tours in Vietnam starting in 1966. My web belt with my ammunition, hand grenades and a couple canteens of water, weighed about 20, 22 pounds. Then we had a backpack and by the time we loaded extra ammunition, extra water, machine gun ammunition, our C-rations, etcetera — the backpack could weigh anywhere from 80 pounds to 110, 115 pounds. We were out on search and engage missions. The commander of our unit used what he called a checkerboard. He would divide an area up into squares and he would take the companies out and put one company in each square. Each square was divided up into squares for platoons. If one unit made contact, there really wasn’t a great deal of time before you could get reinforcements. Most of the engagements that I was in were, I would say, smaller engagements where you were 15, 20, 30 Americans facing 15, 20, 30 Vietnamese. We were going out weeks at a time. Actually, there was one time we were out well over a month and my pants rotted. If it was summertime, you just slept on the ground. We had poncho liners. We’d use them to keep the mosquitos off of us. During the rainy season, we would set up in two-man, three-man positions and we would take our ponchos and make a tent. I got to really hate rain. I was home maybe 15, 20 years before I could actually go out in the rain without a coat and a hat on, without feeling pain. When we were up in the highlands and you had to stop to sleep, it was sometimes so steep that you would have to get on the upright side of a tree and put one leg on either side. You could sit there and then lean back on your backpack and sleep. Former Staff Sgt. 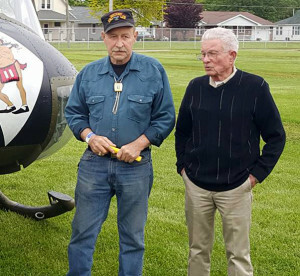 Dewey Smith poses with the pilot who saved his life in Vietnam, retired Lt. Col. Charles Kettles, in Ohio, May 2016. Kettles’ action during that rescue mission would earn him the Medal of Honor. Editor’s note: Special thanks to the Armed Forces Retirement Home in Washington, D.C., where most of these gentlemen now reside. Veterans’ statements have been condensed and edited for clarity.